I almost slept through it! 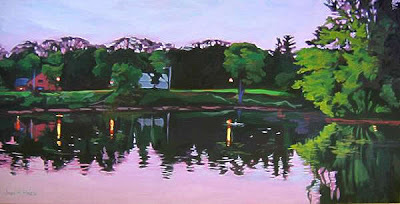 "Rock River Sunset," acr/canvas, 24" x 48"
Yesterday was a busy day capping off an incredibly busy 2 weeks. All my kids have gone back to their lives, the restaurant is back in business after the New Year's holiday, and I got one "big mamma" head cold. I hadn't been back at Affinity AV for almost 10 days and decided it was time to do some non-artwork, non-restaurant stuff for a change. I worked there cleaning up the admin side of the business, had a conference call with Jack (the owner) and 2 old retired ad guys from the Chicago area (another story altoghether!!!) and then it was already after 5:00!!! I had to be at The Next Picture Show gallery for the opening of the "River Reflections" show. Two of my pieces were juried in and my BFF (debbie) is featured artist at the front of the gallery and she had folks coming in for that also. So, I hustled my snot-filled head home to drop off my laptop...way too cold to leave it in the car all evening, feed the dog, say "hey" to the staff and husband, and have a quick bite to eat. Did all that and decided to rest my eyes for a few minutes. Well, I zonked out and woke up at 6:39! Awards are given out at 7! I am the unofficial photographer for this kind of stuff at the gallery and I am the keeper of their website also. Thank the good lord the cops weren't on the highway as I sped to Dixon! I made it and had to park a block away. The place was packed. Wonderful turnout. Debbie and her husband also had a gathering at their place after the show, which of course, I had to go to. Fortunately, since I have such a cold, I only had diet Pepsi for the evening. Which made it great driving home at 10 p.m. and waking up feeling good (besides the cold). Tonight is pretty busy for the restaurant and I'll be making an appearance to make sure everyone shows up. Sunday could be wonderful. No b&b guests tonight and I'm going to work on the figurative painting that has been on hold for quite some time.